It appears King Manfred has decided that baseball is too boring to be played the way it’s been played for over a century. He issued a royal decree for all the land to hear. He addressed all the lords of the league aka the owners about potential changes to the game for consideration in the offseason. 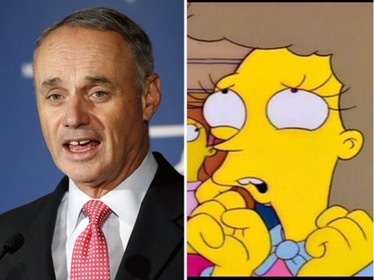 Apparently Commissioner Manfred feels the quality of play is down in 2016, and he wants to make changes to attract a younger generation of viewers. In other words Rob is begging us to think of the children. Won’t somebody please think of the children! Limit Pitching Changes: Apparently Manfred is tired of waiting for managers to make all their situational pitching changes. So he wants to limit the number of permissible pitching substitutions. I’m sure the player’s union will love the idea of the owners eliminating available MLB pitching jobs. I’m sure the agents and all the executives that handle these arms with the utmost care will love the idea that managers might feel compelled to leave pitchers in a game longer because they aren’t allowed to freely substitute someone else into the contest. This idea is terrible and won’t happen. Flush it down the toilet. Next. Stop Shifting: Let me get this straight. Team executives used advanced analytics and spray charts to identify where players typically hit balls and made an effort to position their fielders in ways that minimize balls put in play. As a result we’ve supposedly seen batting averages drop. In most sports when a team utilizes a strategy to take advantage of something, other teams are expected to modify their play to adjust to the strategy. In baseball, the teams and players are so dead set on keeping things the way they’ve always been that they are considering banning the strategy rather than adapting to it. You know what will stop shifting? Hit the ball the other way! Bunt when the team abandons half the field. And don’t give me the “That’s easier said than done” BS. The old time baseball morons are just pissed that all the front office nerds are exploiting something in the game, and they don’t want to tell their top hitters to bunt because they’re too damn proud to make the adjustment. Just do it and force the opposition to abandon the shift. 20 Second Pitch Clock: All the other sports are about time and clocks. But not baseball. That’s what makes baseball unique. I totally agree that hitters spend too much time screwing around in the batter’s box, and pitchers spend too much time walking around the mound. But we need a freaking clock to stop that culture? Get out of my face with that crap. I thought baseball loved unwritten rules and mandates? If we want to stop the dillydallying, then tell the umpires to throw people out of the game if they take too long. Tell the umps to do their job and keep the games moving. Manfred even said, “And, quite frankly, the data shows that people don’t violate the 20-seconds. With or without a clock. It’s a reminder that moves things along.” So he’s admitting the clock does nothing and players just need an occasional reminder to keep playing. Before Manfred starts making all these moronic “outside the box” changes that he probably got from some baseball consulting firm, why don’t we make a few obvious changes that will improve the game and their precious pace of play. Fix Replay: Umm the replay review process is pretty pathetic. 90% of the time I watch the replay on my couch, make the correct call, and then I wait 5 minutes for the umpire to make the correct call. How can it possibly take so long for a central team in New York to relay the correct calls to the umpiring crew in each game? It’s absurd. If you want to implement a 20 second pitch clock, how about you implement a clock for these freaking umpires. Get the damn calls right and get them right immediately! It takes 10 seconds. 7-Day DL: The Mets literally spend half of their season playing shorthanded and debating whether players should be placed on the 15-Day DL. Now the Mets are an incompetent organization. There’s no denying that. But the truth is a minimum 15-Day DL rule is absurd. The minor leagues have a 7-Day DL. MLB needs that same rule. The Mets would still find a way to mishandle injuries with a 7-Day DL but at least the rest of the league would benefit. Keep Juicing The Balls Up: Manfred says baseball is slow and boring, but home runs are way up in 2016. In July, the league was on pace to hit the most home runs since 2000. Home run totals rivaling the steroid era? What’s happening? Well it’s simple. They juiced the balls. They won’t admit it, but that’s what they did. And you know what? That’s genius. Fans love dingers. Kids love dingers. I would much rather MLB publicly announce they are juicing the balls to increase home run totals. That makes the game more fun and then the players aren’t sticking needles in their asses to entertain the fans. Expand The Rosters Damnit: Don’t limit reliever substitutions. Expand the rosters. Let teams carry 30-35 guys. 162 games is an insane number. If they aren’t going to shorten the season then the teams need more troops to make it to the finish line. Sure this probably waters down the quality of the average roster. But who cares? The stars will get the rest they need and more players get the opportunity to play on the big stage. Give Us The DH: I’ve written about this before. I love watching Noah Syndergaard and Bartolo Colon crush bombs, but it makes no sense for the AL and NL to have different rules. If the Mets had the DH, Yoenis Cespedes would have been able to rest his quad injury and contribute with his bat. If the Mets had the DH then the Jay Bruce/Cespedes/Curtis Granderson/Michael Conforto “logjam” would be resolved in two seconds. Juan Lagares would be able to play center field and bat 9th. I realize this opinion is unpopular among NL fans, but I’m ready to adopt the DH. The Mets are built on pitching, and I wan’t to protect the arms. And honestly the Mets would probably wind up DH-ing their pitcher half the time anyway. Decide On The Damn Rules: The league spent half the season inconsistently enforcing the takeout slide rules at second base. Thor was instantly tossed for throwing a retaliation pitch at Utley earlier this year, and then at other times teams were simply warned for the exact same behavior. Maybe Rob Manfred should work on consistently enforcing the existing damn rules before implementing new ones. All-Star Game: Get rid of the World Series home field advantage thing in the All-Star Game. It’s completely ridiculous. The team with the best regular season record should receive home field in the Fall Classic. Period. Cut Spring Training: Spring Training is way too long. Cut it in half. T-Shirt Cannon With Money: Many teams shoot T-shirts out of a cannon during games. Well how about they stuff money in one of the T-shirts during a few games a year? I’m talking big money. 10 grand. Something insane. You want to draw more people to the ballpark? Then randomly launch cash prizes into the stands. And also hire extra security so fans don’t attack each other for the prizes. Actually a cash T-shirt battle royale in the stands sounds a little dangerous. Maybe they should just award the cash randomly based on your seat number? All I know is I want the Mets to pay me 10 grand to come watch their games. Make the check out to The Metssiah. Loosen Up On Content Sharing You Jerks: If MLB wants to attract a younger audience they should probably stop protecting their precious content so much. If you share a freaking video or a home run clip without the expressed written consent of the stupid league they have MLB secret agents busting down your door. I’ve been an MLB.TV subscriber for like 10 years. This season my account was accessed on two devices at the same time in different states. As a result of that they temporarily shut down my account, accused me of password sharing, and threatened to ban me from using the service. Do you realize how insane that is? I’m scared to even share this story on the internet. I’m worried Manfred and his goons are going to break my knee caps as I leave my house to go to work one day. Let people share content and share MLB.TV passwords. You want more people to watch right? Then don’t threaten people for sharing a video of a home run. That’s All I’ve Got: I like baseball. I don’t want to change it. And quite frankly they don’t have to make any changes to reclaim market share. Baseball is going to win the war of attrition against football. It won’t be long before the NFL is shutdown by the courts because of all the concussion and health related litigation. Once that happens, the children will come crawling back to boring old baseball. I don’t think they’ll cut spring training’s length. Spring training has become a really big money maker for MLB and the Florida/Arizona communities that host the teams. You wouldn’t believe how crazy things get around here when we have half of the MLB teams playing daily in an area about the size of Queens/Brooklyn. I think a better approach would be to cut the length of the regular season. Bring it back to the 154 games that were played in the 1950s and earlier. But MLB won’t do that, either. What would really help would be to cut the time between innings. But that would mean fewer commercials. Good luck with that. Perhaps it would be a good idea to encourage the home plate umpire to warn a pitcher or batter that’s he’s fiddling around to much and then the next time it happens, yell “ball” or “strike.” That would get their attention. Oh, and get rid of the f…..g DH. If you can’t bat and field, it’s time to quit. So I would say 1) I’d be in favor of cutting some spring games and regular season games. But I agree with you that they probably won’t do it because they aren’t going to pass on additional profits. 2) One of these days I’m going down to Florida for Spring. Just take two weeks off from work and take in all the action. 3) I used to be in favor of NL rules. My new DH view is unpopular. But I hate that the leagues have different rules. And I feel like they’ll never eliminate the DH. Also I like that AL teams can rest guys with the DH. I hate that they have that luxury and the Mets don’t. But I think it’ll take forever for these owners to even consider adopting the DH in the NL. They’re so scared of change. Might never happen.